The new Vecta Sport is an ultra-modern, compact yet powerful road scooter. This new scooter uses the best of modern design in a very compact overall package with a host of new features that combine to make a scooter that not only looks great but performs even better. With exceptional legroom, an adjustable tiller and super comfortable seat it is a scooter designed for all users. The simple straightforward waterproof dash panel and controls make operating this great new model simple and straightforward. The waterproof USB power output ensures that the users mobile phone is always charged, or alternatively provides the power for a GPS unit for the adventurous. 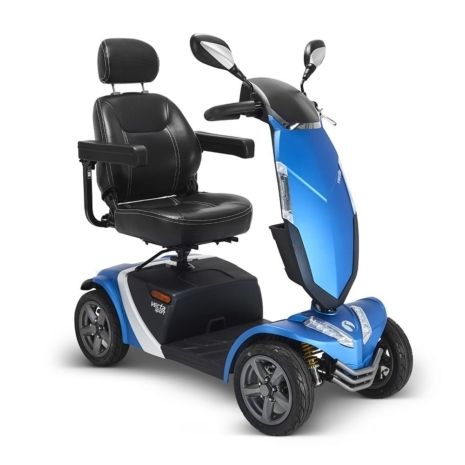 With a 25 stone weight carrying capacity, revolutionary “RunOn” run flat pneumatic tyres, the unique Max Grip Limited Slip Differential gearbox and the new technology high power high torque 600 Watt motor this really is the scooter for the 21st Century.